United limped to only a second victory in their last six games at the weekend, with another European mountain to climb, this time in Barcelona – an iconic location for reds across the globe. Ole Gunnar Solskjær was the hero in 1999, cementing his place in the competition’s history; while Ernesto Valverde is building his own legacy in Catalonia as a first semi-final is in sight. Champions League miracles can happen at the Camp Nou but the odds are against it. Old Trafford was treated to a fairly underwhelming affair last Wednesday, despite a true big European night atmosphere. An early Luis Súarez strike to finish a 50-pass move – via a deflection off now suspended Luke Shaw – sealed the victory for Barça, although La Blaugrana were uncharacteristically sloppy from then on. 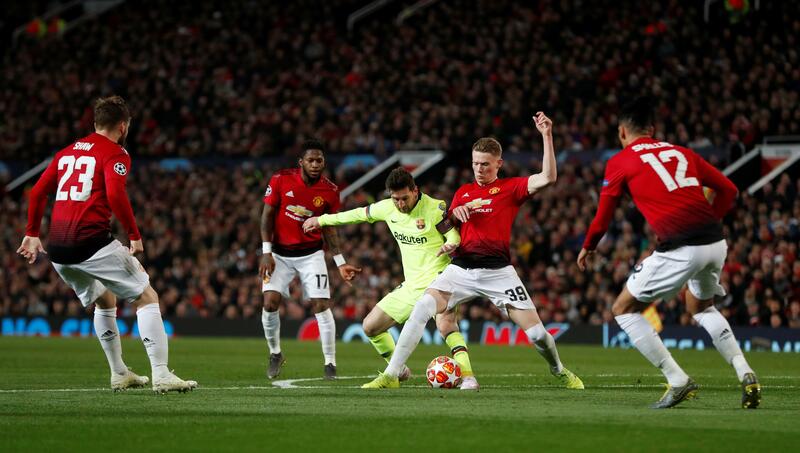 Lionel Messi took a bat from Chris Smalling half an hour in and the five-time Ballon d’Or winner was particularly quiet despite creating the goal. Scott McTominay shone with a dominant display, widely touted as man of the match to silence critics. The Scottish international had a stunning statistical outing, once again proving his worth at the club as a humble yet confident academy product. Fred partnered him and produced another big European performance to keep opposition midfield fulcrum Ivan Rakitić unable to fire. Valverde opted for a starting XI in Huesca on Saturday, with an average age of 24 years and 133 days – the youngest in La Liga this term – as the often-criticised boss made 10 outfield changes. German goalkeeper Marc-André ter Stegen was the only player to keep his place, and boasts four clean sheets from his last five outings. The Borussia Mönchengladbach academy will make his 50th Champions League appearance if he features. In terms of team news, Phillipe Coutinho struggled at Old Trafford, so fit-again Frenchman Ousmane Dembélé may start on the left of an ever-deadly forward trident. The Norwegian claimed the Red Devils couldn’t “be any worse” a sloppy performance resulted in three points. Two precisely-placed Paul Pogba penalties past Lukasz Fabiański canceled out Felipe Anderson’s second half reply but the Brazilian came close when his goal was controversially ruled offside in the 10th minute. Solskjær will return to Camp Nou for the first time since retiring as a player, and becoming a manager, with the memory of him stabbing home in the 93rd minute to quash Bayern Munich and lift the Champions League fresh in red memory cells – completing the iconic treble. However, he felt aggrieved with UEFA for scheduling his team to play Wednesday-Tuesday while the other side of the draw plays Tuesday-Wednesday, telling BT Sport it was his “little complaint” to the governing body. On Monday, Manchester and Barcelona-residing journalist Andy Mitten claimed Marcus Rashford is wanted by the Catalonian giants, with the Wythenshawe-born academy product being what Barça are looking for. Sir Alex Ferguson was on the plane to El Prat airport, almost one year since his brain hemorrhage scare. He was in Paris for that special night over a month ago and might just be a good luck charm. 10 years ago on Monday, Cristiano Ronaldo hit a rocket in Porto to help send United through to a semi-final, which they were eventually beaten by Barça in the Rome final under Ferguson’s guidance in 2009. Alexis Sánchez traveled with the squad yesterday and could feature at his former stomping ground with a “point to prove” according to Solskjær. The Chilean was also involved in a light training session at the stadium last night. McTominay was rested at the weekend but is poised to return following his star showing in the first leg alongside in-form Fred to hopefully once again rattle Sergio Busquets and partner Arthur. Due to another Shaw absence – although the England international traveled – Marcos Rojo may take his place in a back three to attempt to combat his compatriot Messi. However, Phil Jones could well slot in there if recovered from his nasty head cut in time. Nemanja Matić may feature after overcoming an illness, with Solskjær stating he is available along with Sánchez. Barça have progressed from 39 of their 41 European ties in which they won the away first leg – the exceptions were against FC Köln in the 1980-81 UEFA Cup, and Metz in the 1984-85 Cup Winners’ Cup.